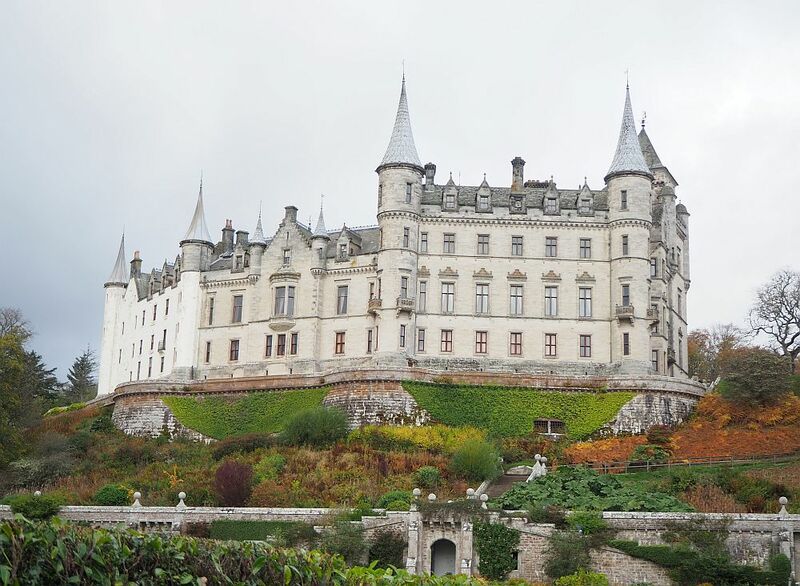 In my last post – about the Scottish Highland heritage tour that I took with my friend, Kate – I mentioned Dunrobin Castle as one of our stops. In reality, we stopped there twice: once on the way north and again on the way south. The first time we tried to see Dunrobin, the electricity wasn’t working. It was a grey, very windy day, and the management had closed the castle to tours. They had posted a sign, but we and several other tourists wandered around, puzzled, for a while, trying to find the entrance, until eventually one of them found the sign, which had blown off the gate in the strong winds. Disappointed, we decided to see whatever we could in any case. We took pictures of the outside of the castle, making our way down the long stairway to the very formal garden below. When you enter the tree-lined drive to Dunrobin Castle, Scotland, this is what you see. 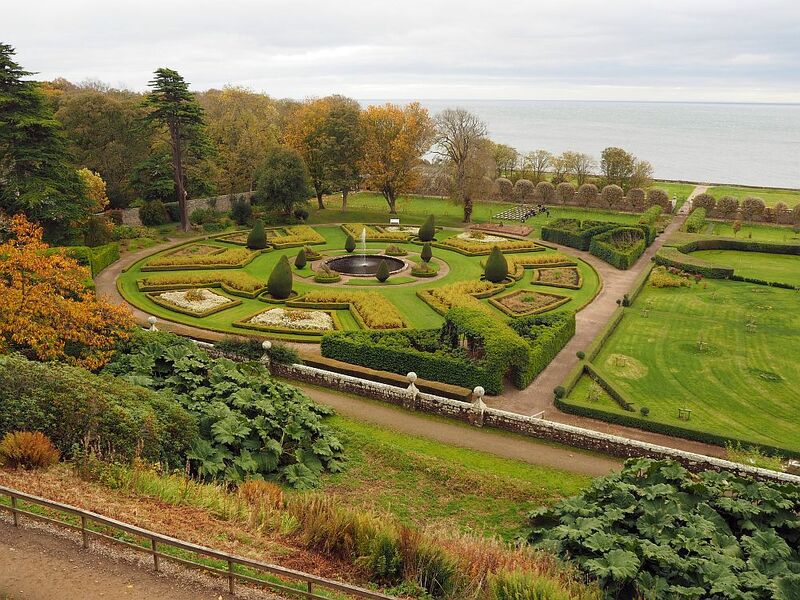 Dunrobin Castle garden is formal in a French style. When we visited, it was well into the fall, and it was clear that the garden is beautiful in the spring and summer. In October, it matched the weather: past its full autumn glory and rather bleak. Even the two large fountains on either side of the garden didn’t cooperate: the wind blew the water well off course. Nevertheless, we wandered around, identifying some of the plants, wondering about others, particularly the massive leaves of the plants beside the stairs. They seemed to us like something transplanted from Jurassic Park. This is just a portion of the garden below Dunrobin Castle in Scotland; I couldn’t get the whole thing in one photo. I took the picture from the base of the castle on a small hill. It was just a little too late in the year to be a pretty fall garden. Toward the far side of the garden, a small group of spectators huddled on wooden benches watching a falconry demonstration. We didn’t stay – falconry didn’t particularly interest us, and it seemed too cold to sit still outside – but went in search of a toilet. On the way, we passed the “cast” of the falconry show: a row of cages and perches in front of the cages where a variety of owls and a few other birds of prey waited their turn. 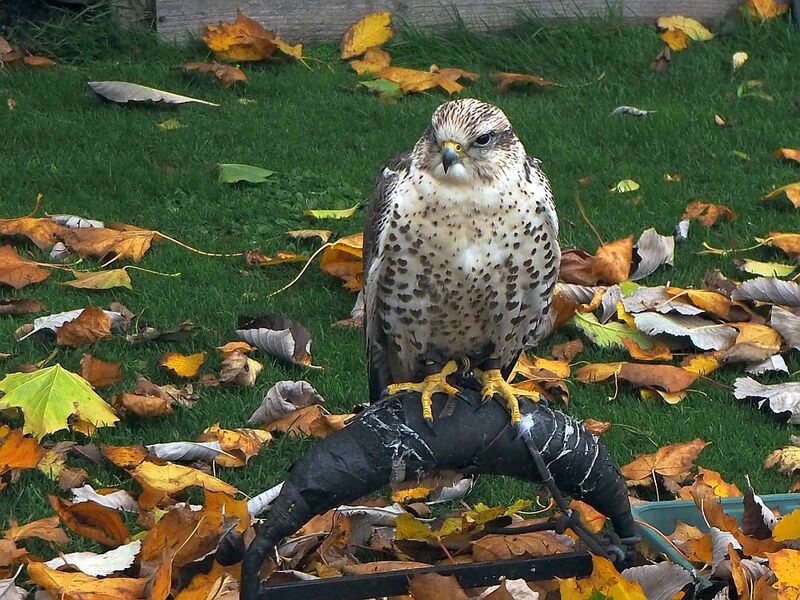 One of the waiting cast members – a goshawk, maybe? – at the falconry demonstration at Dunrobin Castle. 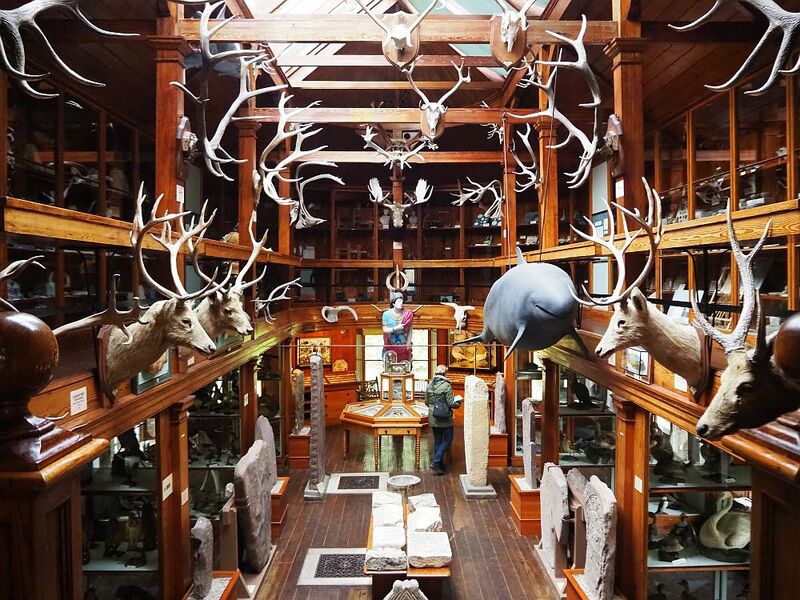 This museum contains a large collection of animals heads, which are hunting trophies dating from the early 1900s. Some visitors have found these offensive. Duly warned, we entered anyway. The first room is filled, as the sign says, with animal heads, stuffed and mounted on the walls. Most, I think, are African. A giraffe’s neck and head stands upright in the center. It is gruesome, yet something about those faces seemed dignified and gentle. 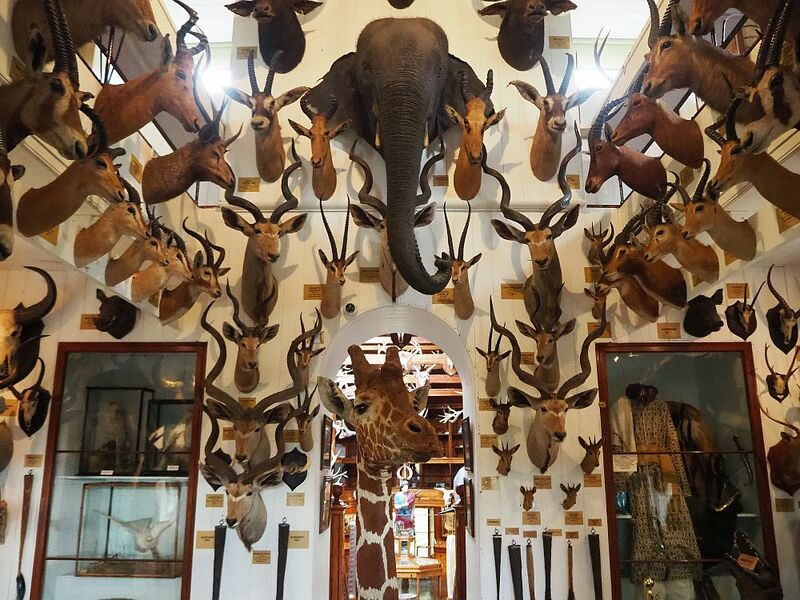 A portion of the collection of hunting trophies in the first room in Dunrobin Castle Museum. The room beyond the animal trophies is much larger and filled with light: it shone, even on such an overcast day, through a glass roof. Here we saw even more animal heads, this time mostly in the form of skulls, but lots of other items are displayed as well. Some are souvenirs brought back from safaris, including some taxidermied animals, but some are local archeological finds. The most impressive are the large Pictish stones, with their ornate and mysterious carvings. In this view you can see, besides more dead animal trophies, lots of historical artifacts and souvenirs in cases lining both the ground floor and the upper gallery. Notice the large Pictish stones below. In exploring our trip’s theme, our Scottish Highland Clearances tour, I had learned a bit about the Sutherland family, who built this castle and killed these animals. 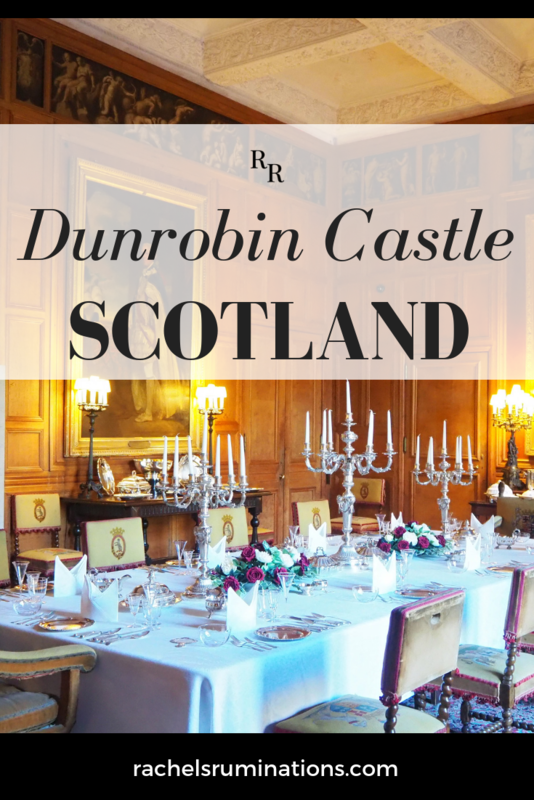 Dunrobin was the estate of the Sutherlands and was probably built on the site of an earlier medieval fortress in the 15th century. The family had the title of Earl of Sutherland starting in the 13th century, and later added the title of Duke. Dunrobin Castle, Scotland, as seen from the garden. Their part in the clearances in the early 19th century was much like other landowners in this part of Scotland: they cleared the crofters (small farmers) off their land in order to earn more income by using the land for sheep farming. The thing about the Sutherlands, though, is that their version of clearing was more brutal than most, or at least their reputation was worse. In their view, what they were doing was modernization, and they saw themselves as benefactors in providing the cleared crofters with better opportunities on the coast in the herring industry. However, some crofters resisted, and the cleared crofts were often destroyed to prevent the inhabitants from moving back in. In one famous incident, a Sutherland employee, charged with carrying out the clearances, may or may not have set a croft on fire with an elderly disabled woman inside. She died soon after, but the employee was found not guilty in the trial that followed. The Sutherlands never managed to clear their reputation. 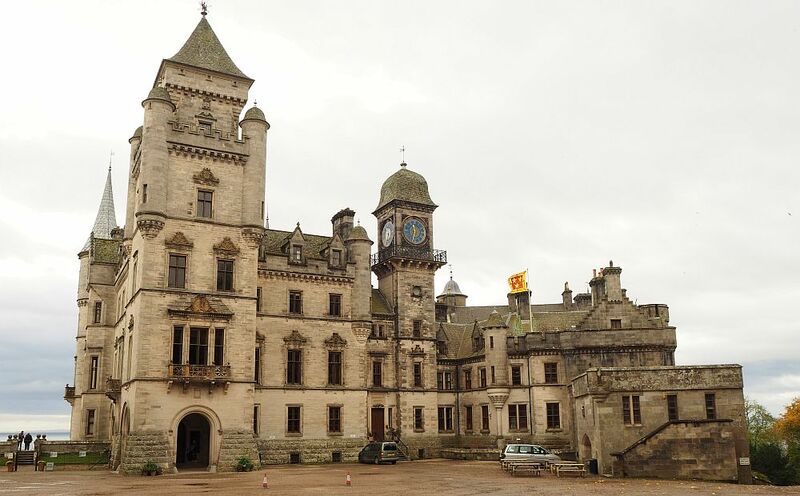 On our return south, we decided to stop at Dunrobin Castle again, and this time the electricity was working and it was open. Paying our admission fee and climbing a grand staircase, we came to the rooms that were clearly intended for entertaining. We wandered room after room, cold on this October day, with high archways and decorative ceilings, as was popular among the wealthier classes in the Victorian period. 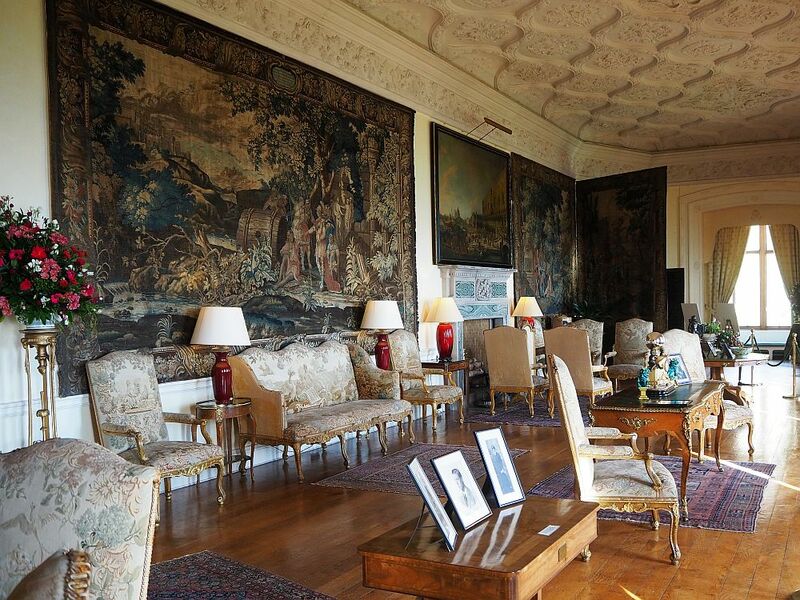 The walls mostly supply space for enormous portraits of various members of the Sutherland family. 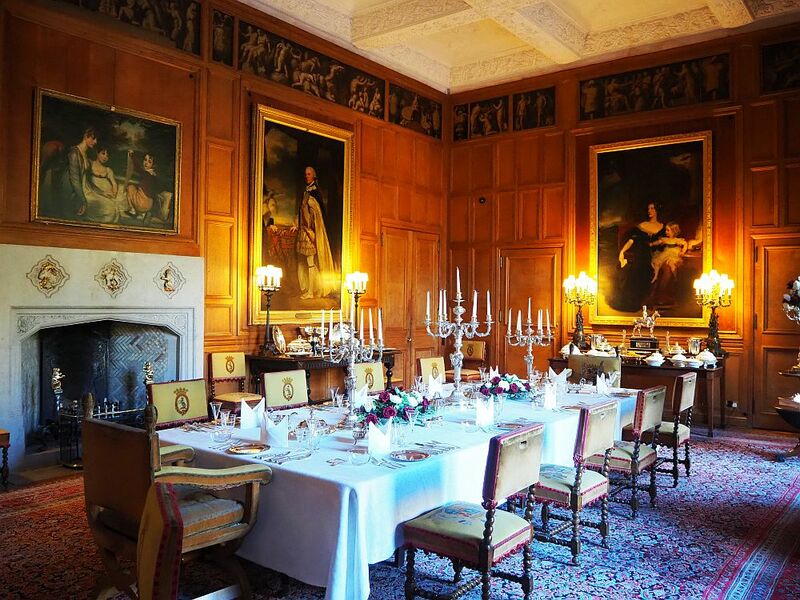 Each room on the designated route we followed had a distinct purpose in this sprawling castle: a dining room for dinner, a breakfast room for breakfast, a music room for playing music. And so on. As we walked, two elderly security guards chatted audibly, ridiculing American tourists. It didn’t create a very welcoming feeling, but we ignored them. While the castle dates originally from the Middle Ages, little of that original keep is visible. It’s been added to and remodeled repeatedly. Most of the rooms we explored were from the extensive remodeling carried out in 1845. A fire destroyed the interior in 1915 so what we see today is a restoration from then. In any case, while other smaller castles we visited, such as Craigievar and Crathes, have cozy rooms you could imagine living in, this castle’s first floor seems more intended to impress than to make a home in. It made me wonder what the Sutherlands were like. A drawing room? A sitting room? In any case, it didn’t give an impression of comfort or relaxation. Further into the route through the castle, however, it gets better. Some rooms are more homey: in particular the bedrooms, the library and the study. In these, you can imagine curling up in a comfy chair with a book. Except for the safari animal pelts on the floor, the library seems a pleasant place to read. Nevertheless, the castle is impressive, both inside and out. Personally, I don’t find it beautiful, but I suppose that’s a matter of taste. The garden, on the other hand, must be lovely in the spring and summer. The museum is pretty horrifying, yet we quite enjoyed the archeological and historical artifacts on display, once we got past the dead animals. Dunrobin Castle is just north of Golspie on the A9, the route that runs north along the east coast of the Highlands from Inverness to Thurso. It’s about 50 miles from Inverness, which is about an hour and 10 minutes’ driving. Or you could take the X99 bus from the Inverness bus station (stance 2) for about an hour and a half, getting off right at the end of the castle’s drive. 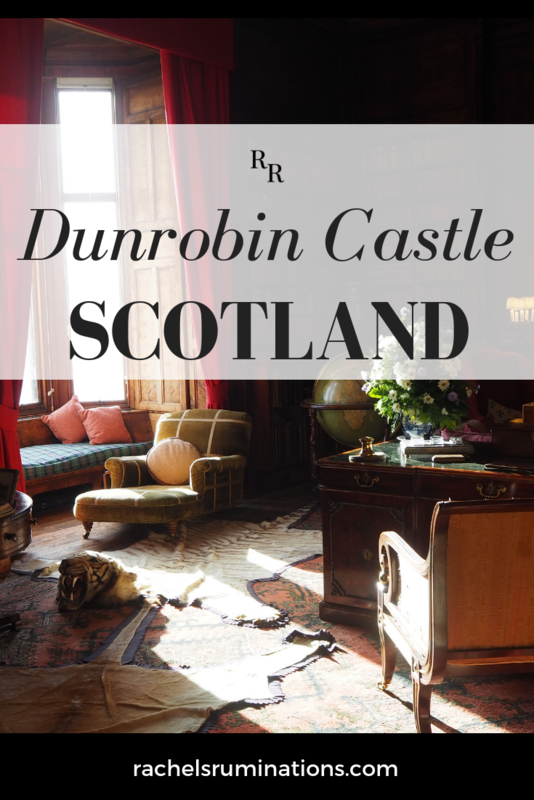 Dunrobin Castle is open from April to October. In April, May and October it’s open daily 10:30-16:30. In June-September, it’s open 10:00-17:00. 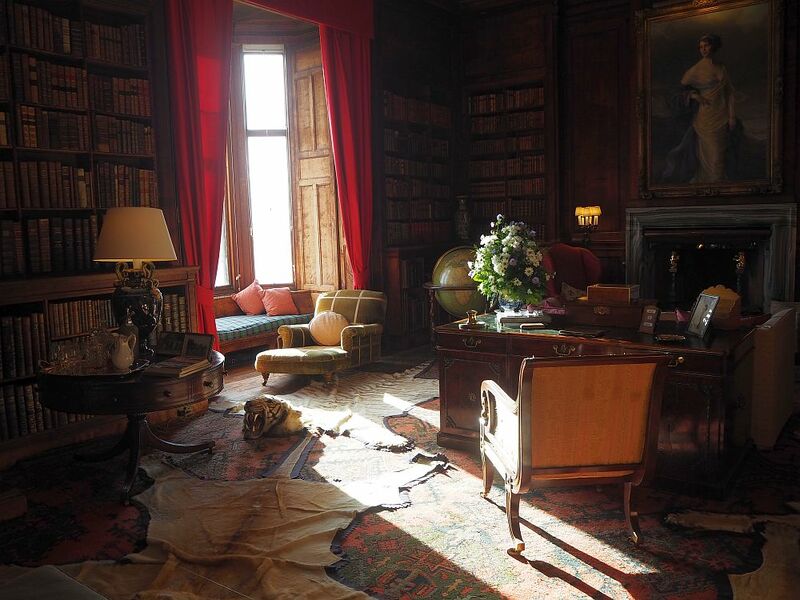 Dunrobin Castle museum is open daily 11:00-16:00. The falconry demonstrations happen daily from April-September (and this year they continued through October) at 11:30 and 14:00. Admission: £11.50 ($15 or €13): includes castle, museum, garden and falconry demonstration. Do you enjoy visiting castles like this? Or are you more of a garden person? Add a comment below! Dunrobin Castle looks like a magnificent place to visit! 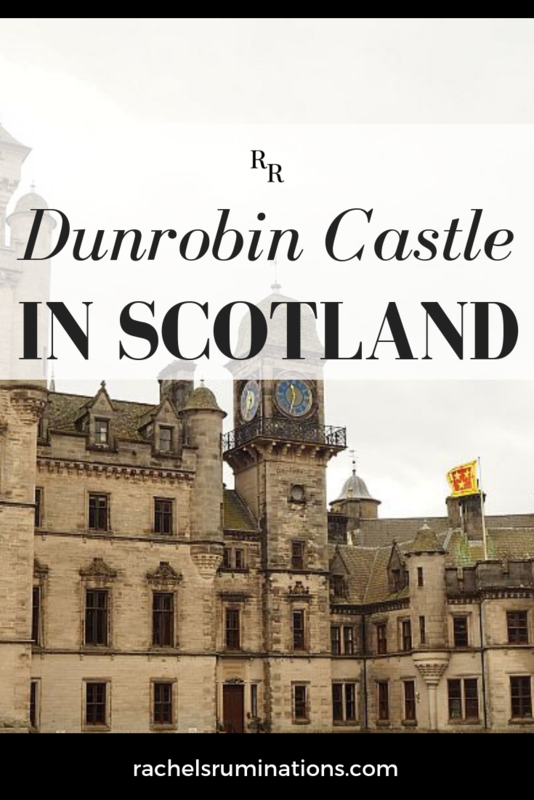 I’ve not yet had the pleasure of visiting Scotland, but when I do, I’d love to visit the Highlands and Dunrobin Castle. It’s hard to imagine how costly it must be to maintain some of these old castles. I’m sure they are quite dependent on admission fees. Hope the electricity gets turned back on! It did! That’s what allowed us to see the inside on our second try. I don’t think it was because of not paying bills. I think it was the high winds. We visited the castle gardens in 2016 and saw the falconry show. We didn’t go inside and there comes your blog to give us a glimpse. I hate trophy hunting and so, I’m not sad not to have seen these dead animal heads. The gardens are beautiful though.